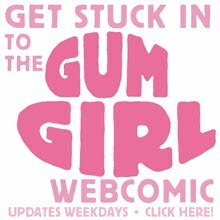 Gum Girl blog: Who dares? It's time for someone to stand up to that robo-mega-bully in the webcomic. Things are gonna change around here - final page! New webcomic page up now!! New webcomic page up now! New webcomic post added today!